Of all the Greek helmets, the Corinthian is probably the most recognized. It was probably first developed in the 8th century BC. Each helmet was custom made for the man who was to wear it. It took a great degree of skill to fshion the helmet from one single piece of bronze. 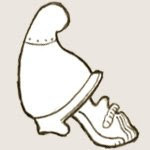 Early in the helmet’s career there were two types of crests. One layed flush on the crown arcing from front to back. The other type was worn high, curling forward at the top. 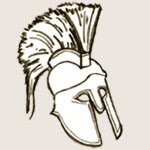 Around the 5th century BC we see representations of Spartans wearing crests transversly, arcing from one side to the other. This was probably a sign of high rank. When not in use, these helmets could be pushed back to rest on the head. This is the position common in greek art as it allows the viewer to see a face. The helmet itself was very strong, but it had some serious drawbacks. The small eyeholes seriously impaired the wearer's vision AND left him practically deaf. After the 5th century the use of the Corinthian helmet fell out of use in favor of more lightweight, open-face types. This greek helmet originated in the Peloponese in the 7th century BC. Unlike the corinthian, the Illyrian was made in two pieces joined together at the crown. The crest always ran from front to back, flush to the helmet in order to help protect the seam. There were also two ridges running along either side of the seam to provide extra protection. “Chalcidian” is a modern name refering to the type of vases on which this helmet is often seen. It was used mostly by the western Greeks and Italians. This took the basic form of the Corinthian helmet, rounded the cheek guards and formed openings for the ears. They often were made with ram heads embossed on the cheek pieces. The temple and forehead were also often deocrated with relief lines. Greek armorers found much inspiration in civilian hats. 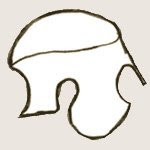 The pilos helmet is based on a felt hat of the same name. The Spartans are said to have started wearing this helmet in the mid 5th century. It was soon after adopted by other Greeks of the Peloponese. This particaular example has attacments for a crest. 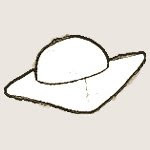 The petasus was a wide-brimmed hat worn to keep the sun away while working in the fields, traveling etc. 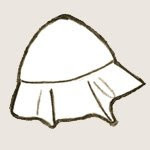 The form of this hat was also appeared as a helmet. It was worn by Greek horsemen and lt. Infantry in the 5th century. Interestingly enough, some of these helmets were covered in fabric to give the appearnce of being nothing more than a cloth hat. This is indicated by helmets that have bee found with holes for stitching. The Beotian was especially favored by the cavalry because of its great visibility. It was a popular helmet, used also by the Romans until the end time of Republic. 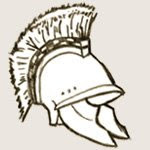 Developed in the 5th century BC, the Thracian was based on a form of cap worn in... you guessed it, Thrace. 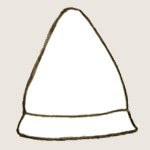 The cap was made of a soft material most often rising to a forward pointing peak. It was re-enforced by a band or hem running across the head. The helmet repeated this from in bronze. 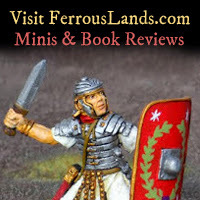 During the mid 4th century BC there was a return to more heavy armor. 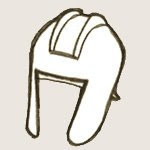 This Phrygian began showng up during this time and soon became the most common helmet used by the Macedonians and the Greeks. 1. Connolly, Peter. Greece and Rome at War. Greenhill Books, 1998. 2. Sekunda, Nicholas. The Ancient Greeks. Osprey Publishing, 1986.